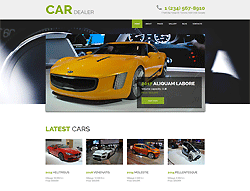 This template for car dealers was designed in multiple colors. The layout of this car dealer Joomla template looks clean and pleasant to the eye. Two slider row with reach background image and slides of the most luxury cars that are offered onsite. The home page includes different sections to supply the visitors with extensive information. Company services are presented in a list. Customers' testimonials are also here which incredibly raises trust to the dealer. Contacts and Google map are at the footer.